Half-off for the full experience! 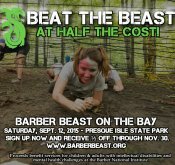 Get in now on the Barber Beast on the Bay and receive 50% off the full price until November 30! The price will never be lower. If you're into adrenaline-pumping, heart-thumping, fun, Beastly action, this is for you. This obstacle course challenge is 10 miles and features sand, water, mud and whatever else Presque Isle State Park has to throw at you. That's just the nature of the Beast! 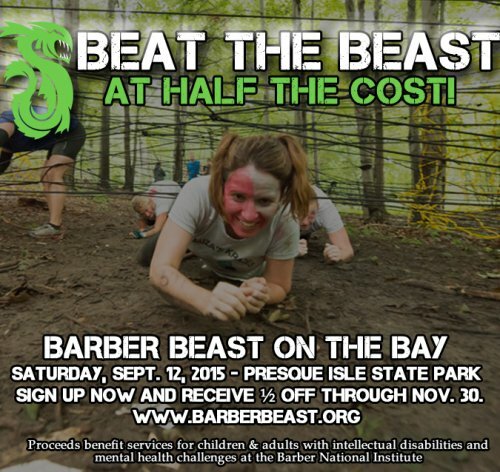 This year's Beast takes place Saturday, September 12, 2015. For more information, please visit www.barberbeast.org.